Good thinking Batman, I'll keep a few rather than bin them. I always keep a couple of spares from empties, you will get the odd torpthat doesn’t pour and just needs the line swapped over. Got one for this price just after Xmas. It’s good. And the beer is good. The tiger lager is really nice. It's part of the torp. Doesn't damage easily. They’re not. Krups is part of group SEB and Magimix is French. All Nespresso machines are manufactured by an OEM with the exception of DeLonghi Lattissima range, Sage Creatista range and the KitchenAid range. Magimix and Krups simply distribute them in certain markets and that’s why there are branded Machines. 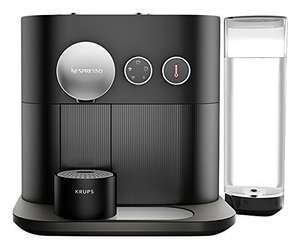 If you look at Vertuo machines on Nespresso’s website you will see they are simply branded as Nespresso, yet the same machines through other retailers are branded either Magimix or Krups. There's no evidence to suggest that they're the same company. Do you have a source? Magimix is just an alternative brand name used by Krups- they are exactly the same machine. Krups use the name in markets that remember their munitions making past. Magimix is their ‘soft’ brandname. Correct, current promotion is on Vertuo Line only. 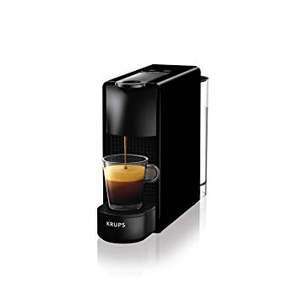 John Lewis have Vertuo machines down from £199 to £109 plus 100 complimentary capsules. I'd love a sage machine but I don't know if I like coffee enough to justify the spend! 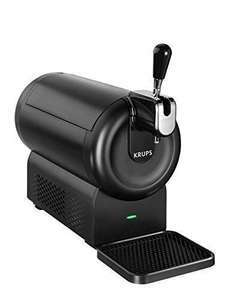 I had a Krups espresso machine similar to this until very recently (was tempted by the sage barista express deal on here!). Lasted pretty well over 3 years, no issues at all with the the pump and internals but the portafilter chrome plating lifted away and it started corroding (krups replaced it under warranty but the second is now doing the same). The coffee from the sage is noticeably better as is the milk but as a relatively low cost entry into espresso this is probably a reasonable starting point. So is it just that they have a diuretic effect? I like the pods. It's a quick fix in the morning and the Aldi/Lidl ones that fit aren't bad either. I'm not a coffee expert but I enjoy these and this machine is the most consistent I've used. Are the pods that bad? They have a warehouse full of 2nd hand Melitta SOLO E950-222 again already. I'm not sure what conclusion to draw from that. Can anyone else not find the free £10 voucher?! £10 voucher Inc on the eBay one? Well had it a week now and no going back for me and the significant other works like a dream and taste as good as any coffee I have had. Heated pick one up today and some pods from Aldi. Easy to use but instructions are naff. I’ve had my eye on this for 4 months and just when I was going to cave-in and buy it, it’s now £30 off! Cracking deal for a well reviewed, all-round pod machine by Dolce-Gusto! I like my Dolce Gusto that my grown up children bought me last Christmas. It cost £75 (not this modal but touch automatic) and I received £50 worth of vouchers with it, I needed the receipt to claim the free pods, that's how I know what they paid. There is no mention of free vouchers with this deal so not a particularly good deal. Pods are great unless youre a cheapskate. This machine is certainly...different! 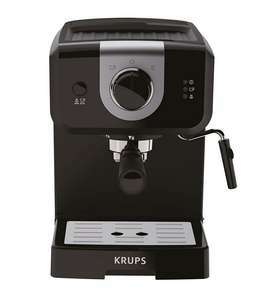 Seems to be about the cheapest price around for this particular Krups model at the moment, £44.99 Argos, £48 Amazon. I bought one of these on Amazon a year ago. There was a few free pods inside plus a discount voucher to order pods from tgeir website. Can you elaborate? What does a slightly more expensive one do that this doesn't? I fancy one but don't know much about them. Thanks. This one is only manual but its a really nice design. Don’t imagine so at this price but might have a sample pod inside. Not sure if this price includes the free 150 capsules offer. actually - don't worry - I took one myself! I don't suppose anyone has a screenshot from the Currys website for this machine - showing the offer ? did you buy the machine from ebay and still get the freebies? I got this the other week. 150 capsules is a good bonus and arrive very quickly for a freebie! Whilst I would normally say Krups; these machines are made in the same factory and have absolutely no difference between them except for the external appearance. So buy whichever is cheapest/best value/more pleasing aesthetically. Claim a £10 club reward when you purchase this product.To claim your club reward visit www.nespresso.com/uk/en and register your product. Offer ends 31/12/2019. Terms and conditions apply. Receive a FREE gift of 150 capsules when you buy this product.To claim your FREE gift visit www.nespresso.com/UKPromotion and register your product. Offer ends 31/01/2019. Terms and conditions apply. Can you claim both?? This is about what I paid for mine in Tesco's a couple of years back - it won't get any cheaper. Great price for an automatic machine. Totally different machine and not an automatic model! Don't buy one if you like your coffee hot like I do. I purchased one last year and promptly returned it. Can't do with luke warm coffee. Something to consider if thinking of purchasing one of these machines. Asda for a start do a full range of compatible pods. https://www.thecoffeemarketltd.com Buy pods by the hundred. Coffee only, buy a milk frotherer and heat/froth your own milk. I've said it on here for years. Will check out home bargains pods. Didn't rate the Aldi ones either. Voted hot, the most realistic price for these machines. This is valuable for someone who is looking to buy similar machine. I have this machine and I think it’s pretty good for what it is. I managed to get this machine and the aeroccino 3 off of someone on gumtree for £40 for the pair but otherwise I would’ve probably got the machine at curry’s from this deal. Good deal but not for the environment as dolce gusto pods aren't recyclable. ;( They've been looking into options for years. Their nespresso pods are recyclable though. May not matter to you but wish I'd known before I bought. I personally don't like the drinks that come out of it, but it's a good price for this model. Keeps asking for a code, the link takes you to their German site. I bought one of these from amazon warehouse. Hadn’t been used once. Still in original packaging listed as “very good”. Still had the code for free 200 pods as well. Maybe worth a gamble.